Citizen scientists working at Cyclone Center now have four storms to choose from when they sign in to classify. Our first set of storms includes Cyclone Alibera, a long-lasting Southern Indian Ocean storm that thrashed coastal Madagascar on New Years Day 1990. The path the Cyclone Alibera followed during the first 3 weeks of its life. The storm formed in the upper right portion of the map and moved toward the lower left. 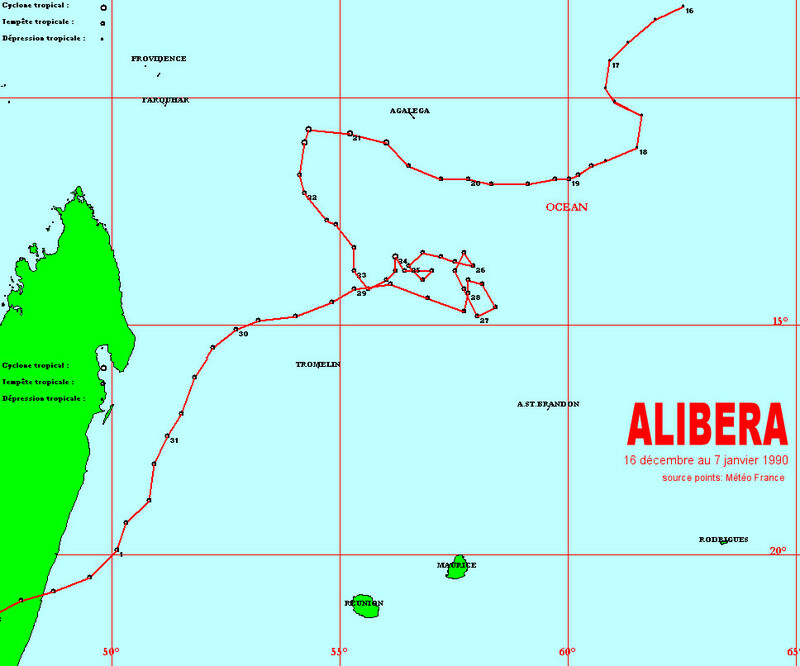 Alibera formed in the Indian Ocean on December 14, 1989 and did not dissipate until January 7, 1990 – a whopping 25 days! During that time, the storm traveled several thousand kilometers, which included a big loop. Cyclones like Alibera are steered by the large-scale winds in the atmosphere. Sometimes when these winds are weak and/or changing, storms can move in strange ways. The first image shows the long and interesting track of Alibera. During the second week of Alibera’s life, the atmospheric and ocean conditions became very favorable for intensification. The storm rapidly strengthened from a subdued tropical storm into a minor or very intense tropical cyclone, depending on who you believe. Two forecast centers tracked Alibera during this time. The Joint Typhoon Warning Center, or JTWC, is a U.S. Navy and Air Force office in Hawaii that monitors the western Pacific and Indian Oceans. Based on imagery like those that citizen scientists are analyzing in Cyclone Center, analysts determined that Alibera was a “Very Intense Cyclone”, with wind speeds on the threshold of Category 5 intensity in the Saffir-Simpson scale. However, analysts at a French forecast centre on La Reunion, an island off the east coast of Madagascar, determined that Alibera was only a minimal Category 1 tropical cyclone at the same time. 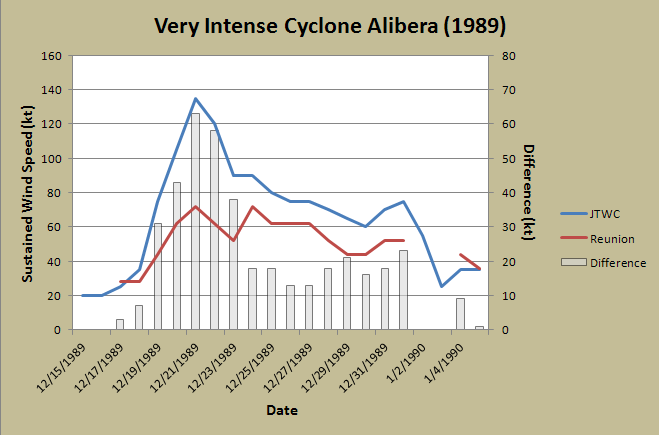 The figure below shows that these differences in opinion were not limited to the time of Alibera’s strongest intensity. Alibera intensities as determined by JTWC and Reunion forecast centers. This is why Alibera is one of the first storms that we would like citizen scientists to analyze. We want to know what YOU think Alibera’s intensity was – we will use this information to reconcile these big differences. Alibera eventually would make landfall in coastal Madagascar on New Year’s day, killing 46 people. Though not widely known outside of the southern Indian Ocean region, Alibera is certainly a storm worthy of our attention – and a good example of how tropical cyclone forecasters can wildly disagree on a storm’s intensity when observations are not available. Log on to Cyclone Center today and classify Alibera.